David Ridley is a Lecturer in Media Theory at Coventry University and is also currently finishing his Ph.D in Sociology at the University of Birmingham. He is Branch Secretary of Coventry University UCU and has been involved in campaigns around casualisation, the use of subsidiary companies and most recently the civic responsibilities of post-92 universities. Here he puts a point of view about our current strategy following our most recent consultation on the pay offer from the employers. Recently his branch published a groundbreaking pamphlet on the situation in Coventry University and an alternative union view to management approaches. You can download it here. On 19 May 2017 the results of the consultation on the 2017 pay offer were sent to branches across the UK. 65.6% of members want to accept the final offer of 1.7% and 55.5% would not be prepared to take part in industrial action after a sustained ‘Get The Vote Out’ campaign. 76.4% members do think, however, that UCU should hold a ballot on pay in Autumn 2017. This indicates that members do not think that this is the right time to take action, and that 1.7%, still representing a real terms pay cut if inflation is taken into account, can be accepted in the short term so that energy can be focussed on addressing immediate problems members and branches are facing. The Higher Education and Research Bill 2017 has now been passed. Not only does mean they introduction of the Teaching Excellence Framework, but also many more ‘alternative providers’ (i.e for-profit colleges and universities) which will now find it much easier to enter the new HE ‘market’ that the Tories have finally managed to create after 6 years. We will now see constant restructuring of existing colleges and universities to meet the demands of this new market. In order to create a ‘level playing field’, new providers do not need to emulate existing institutions, often a complex mixture of research and teaching. For-profit HE will be radically stripped back, fast-track, teaching-only, union-free, focussed purely on the bottom line. In response, senior management teams of existing institutions will want to drastically cut costs and rationalise production. This will mean mass redundancies, increasing casualisation, outsourcing, experiments with corporate form, and in some cases where management are particularly aggressive, de-recognition of trade unions, especially UCU. This process has already begun, at Manchester Met, Leeds University, University of Manchester, University of Brighton, University of Warwick, Southampton Solent University and Sunderland University, the list goes on and continues to grow. Many post-92 universities have tried to get ahead of the game, like UCLan’s dodgy overseas partnerships and Coventry University’s Sports Direct-like employment practices. The good news is that so far, local branches have been very successful in mobilising members and forcing management to back off, for now. More importantly, at a local level, branches have been meeting the new prohibitive criteria for legal industrial action established by the Trade Union Bill, also recently passed. What this tells us, along with the results of the consultation, is that members are feeling the effects of marketisation, along with the uncertainty for Brexit, more than they are feeling the pinch of stagnating pay. This may change as the pound continues to be devalued in relation to the Euro and inflation outstrips wages. But on an affective level, marketisation is felt through increasing insecurity, inequality, workloads and bullying, all leading to stress and sickness. Successful local actions build confidence in our members. Every successful local action builds the union as a whole. Successful recognition campaigns show that the union can move forward within marketisation, not just taking the defensive. Public campaigns against gender pay and casualisation, very painful for management (reputational damage) also driven by local successes, build awareness of marketisation and show our most vulnerable members we will fight for them. ‘UCU Left’ will try to convince you that we need to take action now, but the Independent Broad Left network are offering an alternative strategy. We are not accepting defeat by accepting the pay offer. We are walking away from a battle in order to win the war. We are being strategic rather than ideological and stubborn. The plan that was suggested at the end of last year’s disappointing pay campaign was correct. Regionally coordinated local actions centred on inequality (gender and casualisation, but also BME, LGBT and disability), and increasingly redundancy, outsourcing and attacks on terms and conditions. We believe the unpredictability of and local strength behind this strategy contributed to the increased offer, so let’s talk what we can get and keep fighting. If we want to take national action in a post HE Bill, Brexit and TU Bill world, the priority must be building participation and confidence in both branches and our membership. We can talk again about national action in the not so distant future when we can deliver. 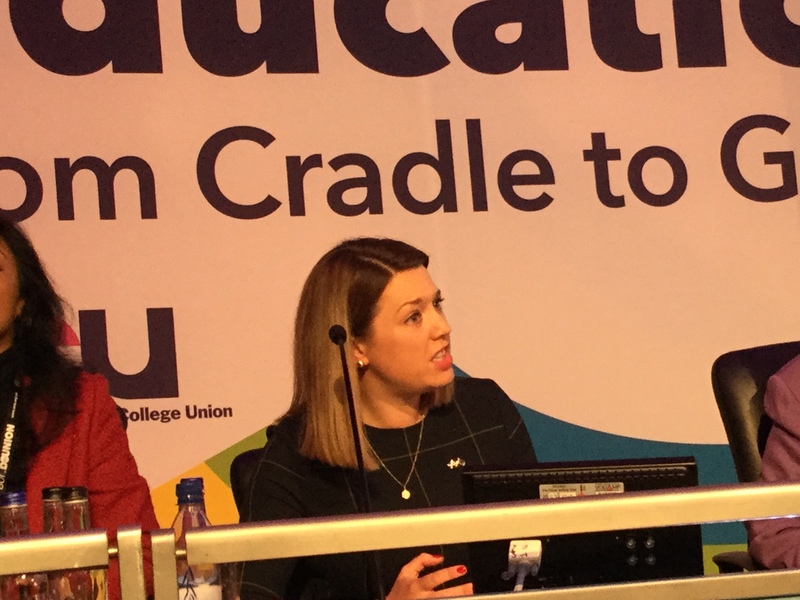 A well attended Cradle to the Grave conference in TUC Congress House put the UCU once more firmly in the centre of the major issues facing us all in post-16 Brexit Britain. A range of key speakers, from shadow chancellor John McDonnell, leading pro-refugee campaigners, Steven Hale, and founder of Care4Calais Claire Moseley, NUS President Malia Bouattia, political commentators Steve Richards and Melissa Benn, together with leading academics Peter Scott and Kalwant Bhopal, and our own UCU General Secretary Sally Hunt were joined from North of the border by Jenny Gilruth MSP, SNP Parliamentary liaison officer for education. A workshop on transforming FE also heard from academics Vicky Duckworth, Rob Smith and Sean Vernell together with Steven Exley, the Further Education editor of the Times Educational Supplement. John McDonnell’s speech which opened conference was, as might be expected wide ranging, although perhaps inevitably also dealt with the internal temperature in the Labour Party, something which resulted in some flack in the post speech discussion. John supported the holding of an enquiry into the impact of Brexit in HE, and pointed out that the education sector did not feature on the current UK government’s list of negotiation priorities. He however, thought that education should be central to the debate on the principle that ‘another Europe is possible‘. He also pledged labour’s support to UCU in ‘building a coalition of opposition‘. The next session of conference saw the launch of the joint UCU-Refugee Action pamphlet on ‘A Place of Safety’ where we heard Stephen Hale chief exec. of refugee action and Claire Moseley, founder of Care4Calais talk of the horrific conditions facing refugees and the disgraceful decision of the current Tory government to ditch the Dubs amendment. This government decision ended the acceptance of unaccompanied child refugees at approximately one tenth of their previously understood commitment. Sally Hunt talked of why this area continued to be a key one for UCU, while NUS President Malia Bouattia also talked of the NUS campaign to support refugees drawing on her own personal experience to illustrate this. Highlights in this session were the focus on the Let Refugees Learn campaign, with speakers pointing out that for many refugees it was at least 2 years until they could sit in a class room and study English. Claire also pointed out that there was no safe and legal route for refugees to claim asylum in the U.K., which put anyone aspiring to get to the UK immediately into the ‘illegals’ category. Peter Scott, the newly appointed Comissioner for Fair Access in Scotland started the next session on the challenge of Brexit and Trump using a powerful presentation downloadable here. He considered the ‘many sides of populism’, and it’s link with education, or lack of it, what he believed had gone ‘wrong’, and ‘right.’ He then considered Picketty’s views on the rise of economic inequality, and the ‘achievements’ and ‘disappointments’ of mass education. He finished up by stating that re-asserting public good/ and the values as the core of the academy’s mission was the ‘unfinished business’ on the table. SNP member of Scotland’s parliament Jenny Gilruth, then talked of how the Scottish government was trying to tackle widening access, including the important of contextualised admissions, and ‘taking direct action to create a level playing field’. Firstly, the need to seize the major opportunity opening up for Further Education in terms of the skills that will be needed in the post Brexit world. Tackled correctly, this could help win the argument that FE is needed more than ever. 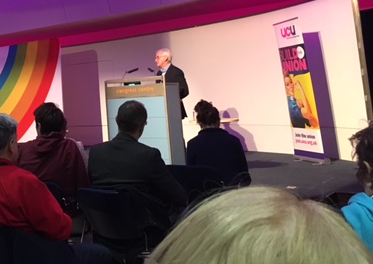 Secondly Stephen Exley, the Times Education FE editor made the key point that we could not just ‘talk to ourselves’ and that we needed to win the arguments outside the UCU by ‘taking the necessary talk‘ in all the possible forums available to us. Thirdly we needed always to celebrate how FE can and should transform lives, families and communities. Vicky Duckworth and Rob Smith’s UCU project http://transforminglives.web.ucu.org.uk/ was a fantastic example of how to do this and those attending the workshop were asked to make full use of the UCU initiative allowing individuals to directly e-mail their MPs and call on them to invest properly in the recruitment and retention of more further education staff to ensure that more people can benefit from the transformative power of education. Finally Sean Vernell arguing the case for making the curriculum more inclusive and effective rather than repeatedly setting people up for (re-sit) failure gave a compelling argument for ‘themed learning’ quoting the initiatives at City and Islington College and other London Colleges. In the final joint session of the conference columnist and commentator Steve Richards talked of his view of the insurmountable problems now facing the government due to the Brexit result, and how we might take advantage of it. He thought that her non-Thatcherite and indeed non Cameronite or Blairite restating of the role of government and even the state in a modern society was one that campaigners needed to take up and use from our point of view. Malia Bouattia talked of the work done with UCU on issues like the NSS survey and the need to recapture education for staff and students. Melissa Benn talked of how the government was trying to reshape universities as temples of consumerism and conformism, and stated that the government were ‘tackling the wrong question, with the wrong people, in the wrong way’. She also made a devastating argument against current increasing Tory support for selection in schools. Sally Hunt then finished the conference by talking of the battle against casualisation and the implications of the HE bill, and quoting Primo Levy’s words of the ‘would be tyrant waiting in the wings with beautiful words’ argued for the need to take back the language being used in the current debates against intellectualism and even experts, and restate the real meaning of truth and evidence. At the end of the conference, a very moving film 722 TMX Engineering battalion looking at a refugee camp in the town of Alexandria in Norther Greece. Talking truth to power. But what are the next steps to win the battle? The HEC at its last meeting took a decision to pause industrial action and conduct an indicative ballot of HE members on the way forward. Here are some points from the Independent Broad Left Network regarding the next stage in the battle to achieve better pay, close the gender pay gap and end casualisation. It would be easy but mistaken to see the decision taken by HEC on 14 October to pause industrial action on the 2016 pay offer while conducting an indicative ballot of HE members as a retreat. Looking at the achievements and difficulties of our pay dispute, and at the political and economic situation in which we have to go forward, HEC has chosen to move to decisions about next steps which will be informed by the judgement of the people who will actually have to implement them about what will achieve the most for us all. In taking the decision to hold a consultative ballot HEC is working constructively with members by asking them to make an informed judgement about how best we can all work together to make progress in very difficult circumstances. We are not retreating, but strengthening the trust, good sense, and ability to deal with tough situations, on which the effectiveness of union campaigns always depends. An audience of up to a 100 listened to speakers at the 3rd Convention for Higher Education in UCL’s Darwin lecture theatre today where educational experts, UCU activists and others condemned the proposals in the UK government’s Higher Education and Research Bill. John Holmwood opened events by a devastating critique of the proposals, declaring that ‘it’s the nature of the public university that’s at the heart of this discussion’. Member of the House of Lords and professor of public sector management at Kings College London, Baroness Alison Wolf, went on to condemn the flimsy ‘cod’ market economics underpinning the proposals, pointing out that what she called a ‘very underdeveloped form of economic thinking’ had come to dominate the debate’ which was ‘ a genuine step in the wrong direction’. Martin McQuillan of Kingston University pointed out that the whole fees debacle which would now be exacerbated was a ‘question of intergenerational justice’, and he castigated the universities for being ‘on the wrong side of the public debate’. Amber Rudd’s proposals to cut international students to all but Russell group universities were roundly condemned by all speakers – as were the efforts by some in the Russell group itself to lobby in support of these divisive proposals. Malia Bouattia, NUS president suggested that the prospect of ‘market exits’ by some of the proposed new providers which would fail (as some inevitably would), might be seen by Teresa May as a sign that the ‘market was working well’. The conference also heard and condemned the current situation at London Met university, and also spent a useful session looking at the joint work that could be done in different areas, to help weaken the Bill and work towards defeating it. Maybe interested in the Independent Broad Left Network in UCU? Well we’re the Independent Broad Left Network in UCU and as well as some good ideas for the union, we’ve also got a sense of humour. Why not come along, have a drink, in one of Liverpool’s most historic pubs, find out more, and let us know what you think? Vicky Knight is a trade union studies lecturer at The Manchester College with 25 years active experience within the public sector, in both the Fire Brigades Union (FBU) and UCU. She was recently elected as Vice President of UCU and will take up this position at the end of the UCU’s UK Congress 2016 . As well as her NEC membership and being an FE negotiator, she has represented UCU at the TUC annual Congress,TUC Women’s Conference and TUC Women’s Committee and has been chair of the TUC Women’s Committee for the last two years. Here she is interviewed by Douglas Chalmers, president of UCU Scotland, and quizzed on her ideas on the big issues facing UCU, particularly in FE in the next 2 years. It covers Vicky’s ideas on cuts, loans, lack of bursaries,ESOL, training, student development, area reviews, national bargaining, membership density, making the union more attractive to women – and many other things. The video is approximately 10 minutes long, and thanks go to Janice Aitken Scotland Hon. Secretary for the camerawork! Sorry about the slight slippage in lip-synch at bits – we’re working on that. The Green Paper on higher education which will open up the sector to private providers. The review of post-16 education, and the crisis in funding, which could see 4 in 10 colleges close. The continued pressure on pay rises, and the intensification of work demands. The UCU Independent Broad Left (IBL) network supports the need for UCU to make hard strategic choices about prioritising resources to meet the challenges we face in this ever more hostile environment for post-16 education. This requires a union leadership which puts members first, and seeks to involve them, and emphasises core professional and trade union issues – education, research, jobs, pay, conditions, equality and professional autonomy. “This Government’s ideological agenda is clearly hurting everyone in our communities. As workers, educators and researchers we are continually doing more for less, in increasingly stressful environments – over-worked, underpaid, our workplace rights eroded, increasingly precarious in terms of job security, our professionalism undermined, and terms and conditions constantly under attack with privatisation looming. We also face the (anti) Trade Union Bill, designed to subvert our right to strike, congregate and demonstrate – all of which are fundamental trade union and workers’ rights. We must maintain at all costs the right to withdraw our labour – an action which UCU members never undertake lightly. Our strength is our democracy, using our collective ability to negotiate and exhaust political alternatives rst. In order to defend our members in the current climate, a vital objective and focus of the union must be the strengthening of our branches – the absolute foundation of our membership – including increasing our numbers, and thus empowering us to use our collective bargaining and negotiation skills to improve members’ lives. Some aspects of Vicky’s experience. is a trade union studies lecturer at The Manchester College. has 25 years’ active experience within the public sector, in both the Fire Brigades Union (FBU) and UCU. has a strong commitment to the principles of justice, equality of opportunities, fairness, inclusivity and a voice for all. holds branch, regional and national representative positions in UCU, including NEC membership and FE negotiator. is a member of the UCU Equality and Women’s Committees. has represented UCU at the TUC annual Congress,TUC Women’s Conference and TUC Women’s Committee. has been chair of the TUC Women’s Committee for the last two years. in the face of relentless government and employer attacks on further and higher education, our unity is our strength. See below for endorsements of Vicky and her approach from a wide range of UCU members.